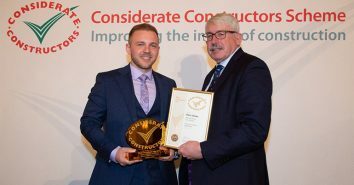 The best performing construction sites across the UK and Ireland have been crowned with the industry’s highest accolade of ‘Most Considerate Site 2019’ at ceremonies across the country. Close to the River Caldew in central Carlisle, this short project to dismantle a gasholder on an industrial site and restore derelict land has left a lasting impression. The team’s approach to testing the atmosphere of the gasholder before anyone was allowed to enter it was unprecedented in its detail, testing and content. Its approach to the workforce’s welfare was excellent, extending to site visits from a healthcare professional and the provision of healthy snacks. The high welfare standards included a TV and a DVD player for quiet periods, as well as relevant literature. The privacy of local people was carefully taken into account, with most of the site concealed, while allowing space for the public to view the works; a nearby disabled business owner also received assistance. As the site is of long-term interest, local industrial history groups were invited to share their views and knowledge. The team should be highly applauded for demonstrating that short-term projects can have a powerful impact on a local community when managed with vision and consideration. Everyone involved is truly a worthy winner. Located in Solihull, this project comprised the refurbishment of a modern office building on a business park. The Scheme’s First Impressions initiative was addressed with bespoke debris netting to Heras panels and site updates were regularly posted on social media. The site was spotless, with the workforce actively encouraged to ensure it stayed that way with ‘Friday Tidy Time’. The team was enthusiastic about the local area and all its workforce came from within a 25-mile radius. CCS is strongly promoted on-site via a talk by the CCS champion, branded literature and signage. It also promoted college placements, a company graduate programme and its involvement with disadvantaged groups. The first-rate team was extremely committed to fair treatment of the workforce. Religious considerations and cultural needs could be accommodated on site and there was access to literacy and numeracy training, occupational health provision and financial and counselling services. Free electrical equipment PAT testing was available and recreational needs were catered for, with items such as a dartboard and puzzle books left in the welfare area. This superb team has shown foresight and focus throughout this project. Many congratulations to you all for your commitment and dedication. This project consisted of an upgrade to 175 properties in six blocks in Camden, north-west London. The contractor’s trailblazing app was just one example of how it was always looking for new and improved ways of working. Residents, staff and clients stayed informed about projects as well as developments in the construction industry. It also included links to relevant websites (including the Considerate Constructors Scheme), contact information and newsletters. There was even a version designed for youngsters, which promoted career opportunities with the company. 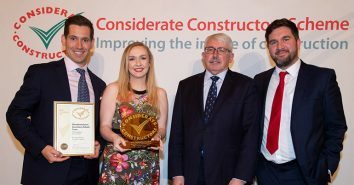 The contractor’s construction management training schemes were also promoted to the King’s Cross Construction Skills Centre and to sixth form pupils at a nearby school. Another great idea was storing a small emergency phone in a red box attached to the site toolbox. This could be used by both operatives and members of the public. In addition to the ‘Employee of the Month’ award, any operative who was extra considerate qualified for a further award. 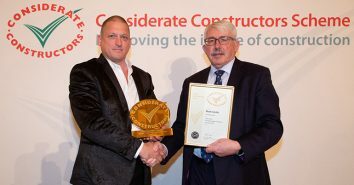 With its plethora of ideas and innovations and its positive impact on the residents it is no wonder that this highly considerate contractor is among the industry’s crème de la crème. You have set a magnificent standard for others to follow in the future. This project involved the construction of a new university centre for Rotherham College on a former hospital site. The site simply buzzed with innovations. The team noted that there were a high proportion of cyclists around the site so it produced a virtual reality presentation for the community to improve awareness of cyclists and road hazards. Another clever idea was to create bespoke signage for the management and control of vehicles on the project which included a ‘captured the vehicles’ log sheet, description of materials, times, dates and fuel type. A photo was taken of the sign daily for BREEAM accreditation. For the ‘A Life in your Shoes’ campaign, a manager walked around a site wearing a body action camera. Operatives who later watched the video were better able to identify hazards and modified their behaviour as a result. The use of QR code scanning of fire points also provided a more reliable electronic record. 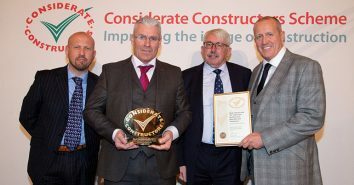 Huge congratulations to this site for its pioneering approach, energy and sheer inventiveness – their achievements are significant, not just for this the site, nor the community of Rotherham, but for all of us in construction. The works at this site entailed the construction of a new build secondary school next to a fully operational primary school in Streatham, south-west London. The scale and scope of this enthusiastic and dedicated team’s accomplishments is truly breath-taking and leaves a legacy that will improve the area’s community for many years. For example, due to the temporary loss of access to the school’s ecological area, the contractor developed a six-week Urban Beach programme to raise the children’s awareness of the coastal environment. It culminated in the pupils visiting Grain Coastal Park in Kent. 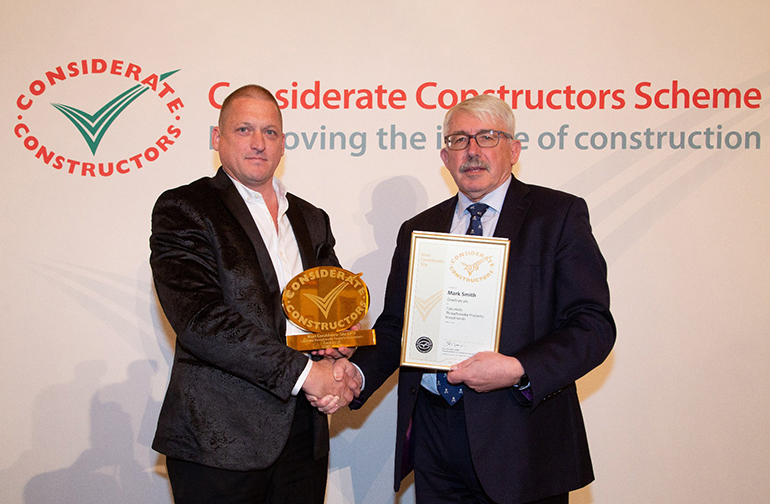 The contractor worked with HMP Elmley to help 38 inmates acquire construction-related qualifications. 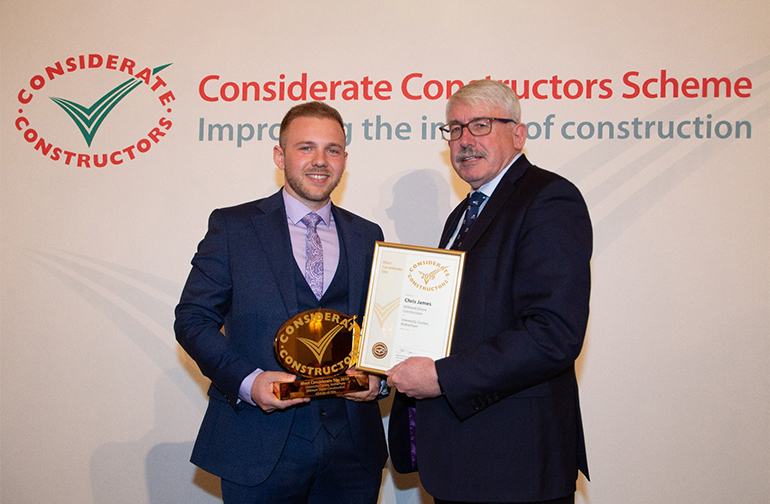 It also introduced a programme to encourage returners to the construction industry after a career break of more than two years. In addition, the contractor set up a community fridge where residents and retailers could leave surplus food. A national programme was subsequently developed and the school committed to maintaining the fridge after the project ended. Indeed, the Monitor commented that “it is hard to find fault, and equally hard to properly reflect, the team’s commitment and enthusiasm in a report”. 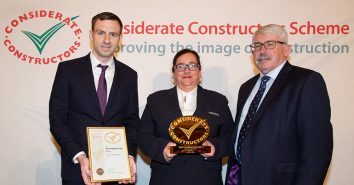 These phenomenal triumphs surely merit the greatest accolade and it is our great pleasure to bestow a ‘Most Considerate Site’ award to this fantastic team which has demonstrated vision, consideration and determination in abundance. This final phase of a significant housing development included 270 luxury apartments in a prestigious area of central London. This stunning building, already a highlight of the London skyline, has earned the team a number of top accolades. Inspired by the media focus on limiting plastic waste, the contractor fitted a Public Recycling Zone within the hoarding. A USB charging point was also added so passers-by could charge their phones while relaxing on the seating provided. The contractor also took an innovative approach to ensure cyclist and pedestrian routes were maintained. Working in close collaboration with TfL, the team used the central reservation as a Cycle Superhighway with specialist bollards installed so the cyclists were segregated from other traffic. A public cycle repair station was also available to some 3000 daily cyclists using the route. 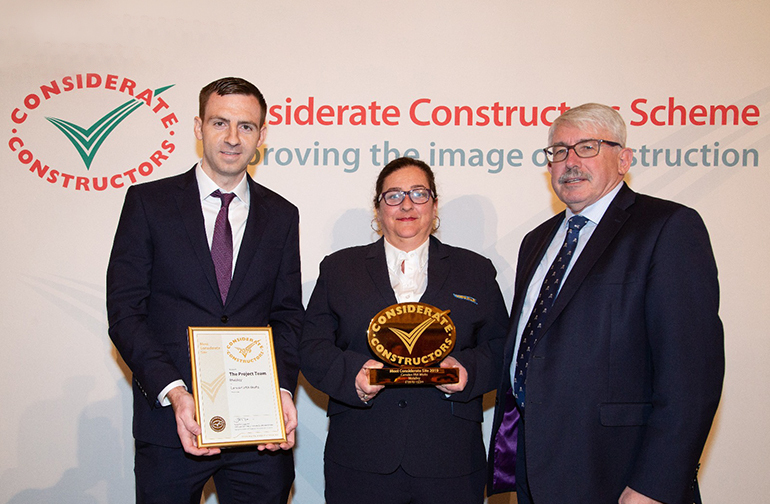 The contractor supplied hard hat stickers with the One Blackfriars logo shown in Pride in London colours and multi-coloured boot laces to support LGBT workers. It also rebranded the hoarding during the celebrations. 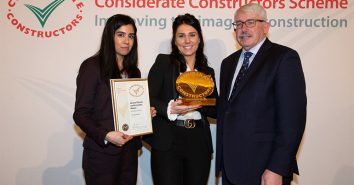 This team has shone a light to show to the world just how magnificent the construction industry can be. This is an absolutely incredible achievement, on a massive scale, which will have a lasting impact on our sector, our capital city and our perceptions of what we can achieve. Congratulations to all the 2019 National Site Award winners. 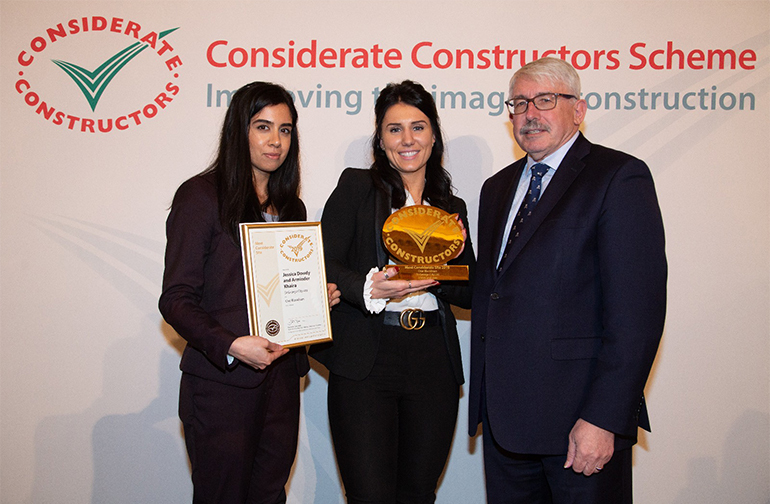 Each award winning site should be extremely proud of receiving this prestigious industry accolade, which recognises their invaluable contribution to improving the image of construction. 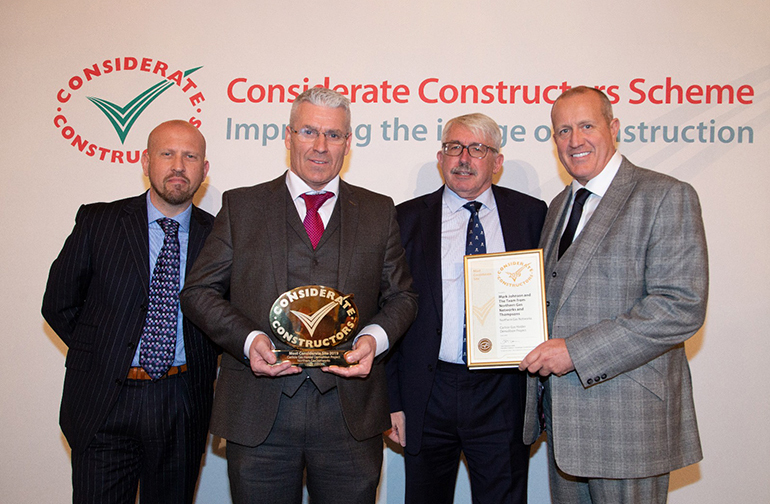 Special congratulations must go to the highest performing construction sites winning the coveted title of ‘Most Considerate Site 2019’, which represent the very best of the construction industry in how they have raised their standards of considerate construction to the highest levels. 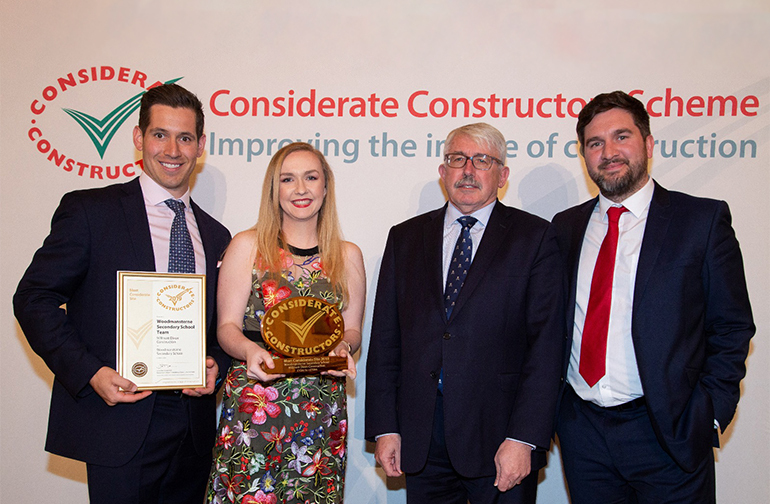 Year-on-year, the Scheme places a higher level of expectation for the 7000 plus construction sites typically registered with the Scheme at any time. We work with sites to push the boundaries of what is achievable and this year’s accomplishments by sites have certainly not disappointed, with over 764 sites receiving National Site Award recognition. 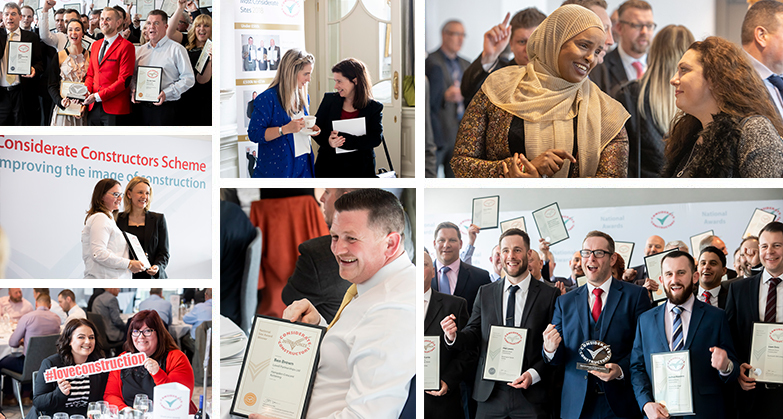 We are always amazed by the increasing levels of performance on site across the country, and we look forward to performance continuing to increase through next year and beyond. Photos were taken by professional photographers throughout the ceremonies, select the thumbnails below to see a selection from across the 11 exciting days. Photos are available to purchase as royalty-free digital downloads (unrestricted commercial use) and as prints available in a number of sizes. A number of shots are also available to download free of charge. 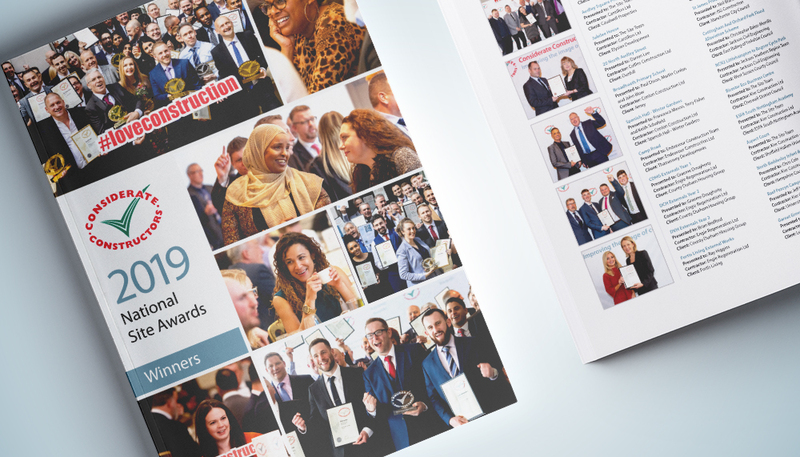 Follow the Scheme on Twitter, Instagram, and LinkedIn and remember to use #ccsawards #loveconstruction in all of your posts to join the awards conversation!